Snowdon (Yr Wyddfa in Welsh) is the highest mountain in Wales and England. It's one of our most famous and regonizable landmarks and is well worth a visit. Standing tall over the village of Llanberis, Snowdon is a part of a close-knit family of jagged peaks and can offer views of Snowdonia, Anglesey, Pembrokeshire and Ireland. Choose from six different paths to conquer this 1,085 metre (3,560 feet) giant which are the Llanberis path, Pyg Track, Miners’ Track, Watkin Path, Rhyd-Ddu Path or the Snowdon Ranger Path. Below you'll find information on the different routes, transport, mountain guides and if you're looking for accommodation then please visit our Where to Stay section. Please read the information below before venturing out on the mountain. 1. Plan your route carefully before you set off by choosing a route that suits the fitness level of everybody in your group, not just your own. 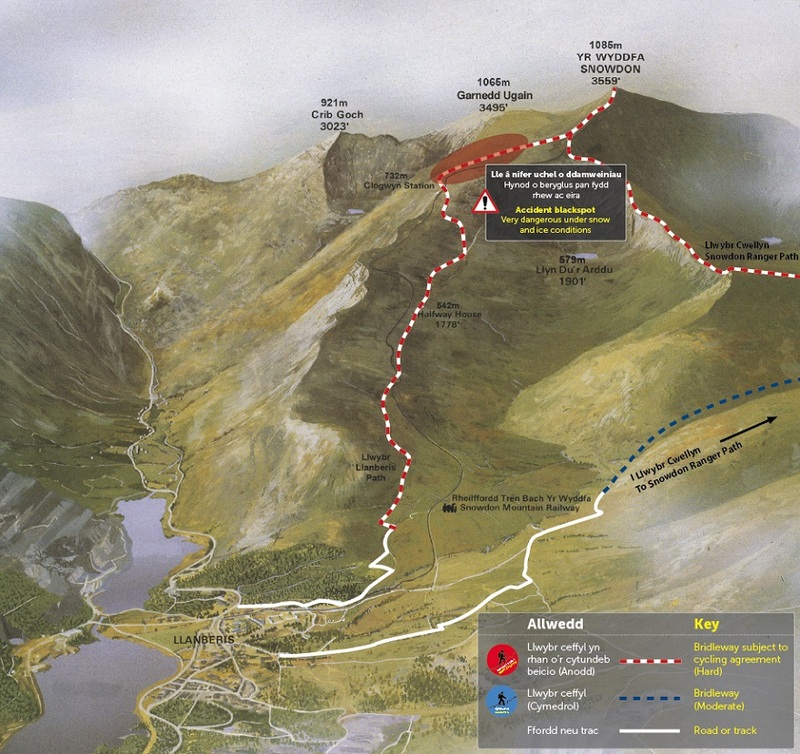 We recommend the Llanberis path if this is your first time climbing Snowdon. Reaching the summit is only half the battle so be vigilant as you descend the mountain, as you will become tired and are more likely to slip or trip at this point. 2. Keep to your planned route at all times and don’t follow others ahead of you – they may be taking a much more challenging and dangerous route than you. 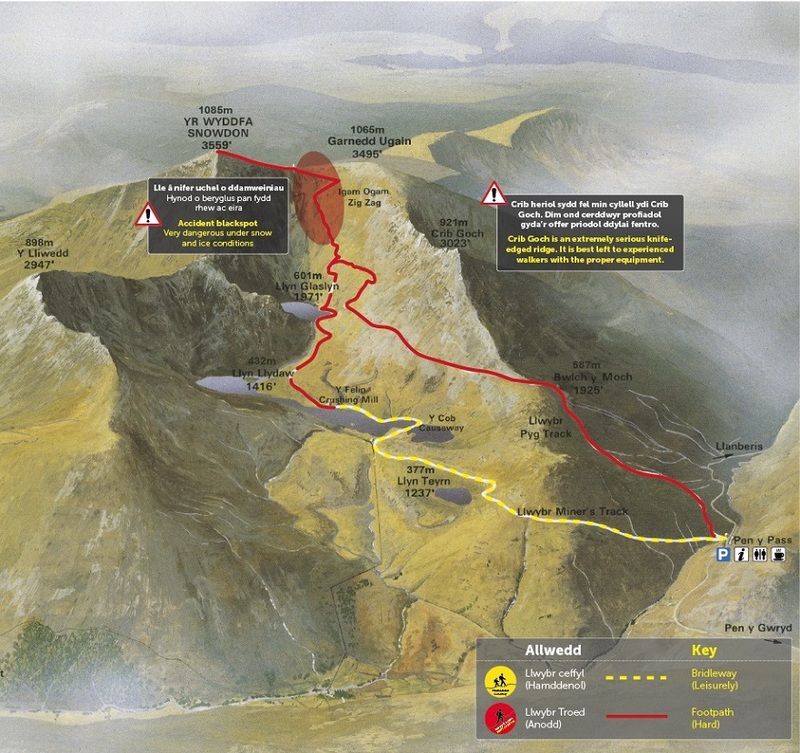 The biggest cause of mountain rescue incidents on Snowdon is of people getting lost, so make sure you take a good map. We recommend the Snowdon Map and Guide, which can be purchased at Pen y Pass as well as at Betws-y-Coed and Beddgelert Tourist Information Centres. 3. Wear comfortable, ankle-supporting walking boots and suitable clothing. The terrain can be uneven and the weather unpredictable. You'll need a waterproof and windproof jacket and over trousers. In wintry conditions you’ll need to take extra clothing such as a thermal base layer, fleece jacket, gloves and a hat. Often in winter the mountain can only be climbed using an ice-axe and crampons. 4. Carry a rucksack that can accommodate plenty of food and drink. It’s important to maintain your energy levels, as walking can be hard work. Remember that Hafod Eryri – the summit building may be closed at certain times of year. During the summer, make sure you carry extra water and sunscreen, as there is little shade to be found in the mountains. 5. Carry the right equipment. Make sure you pack an extra layer of clothing as temperatures can plummet high up in the peaks. It’s vital to carry a torch, compass, map, whistle, first aid kit and mobile phone, but remember – you’re not guaranteed a signal on the mountain so don’t rely on your phone if you get into difficulty. 6. Check the weather forecast before you set out and if the weather deteriorates, turn back. Conditions on the mountain can change quickly with fierce winds, low clouds and freezing temperatures making visibility and walking impossible. Visit the Met Office website for a detailed weather forecast before you set out. In winter you will also need to check the snow and ground conditions. 7. Tell someone reliable about your plans, which route you’re taking and what time you expect to return, so they can raise the alarm if you don’t make it back by your given time. Remember to let them know if your plans change at all. Snowdon’s terrain is challenging at the best of times therefore before heading out please make sure that you have checked all of your equipment. This short video is full of tips for planning the day and details on the Snowdon Sherpa Bus Service are at the bottom of the page. 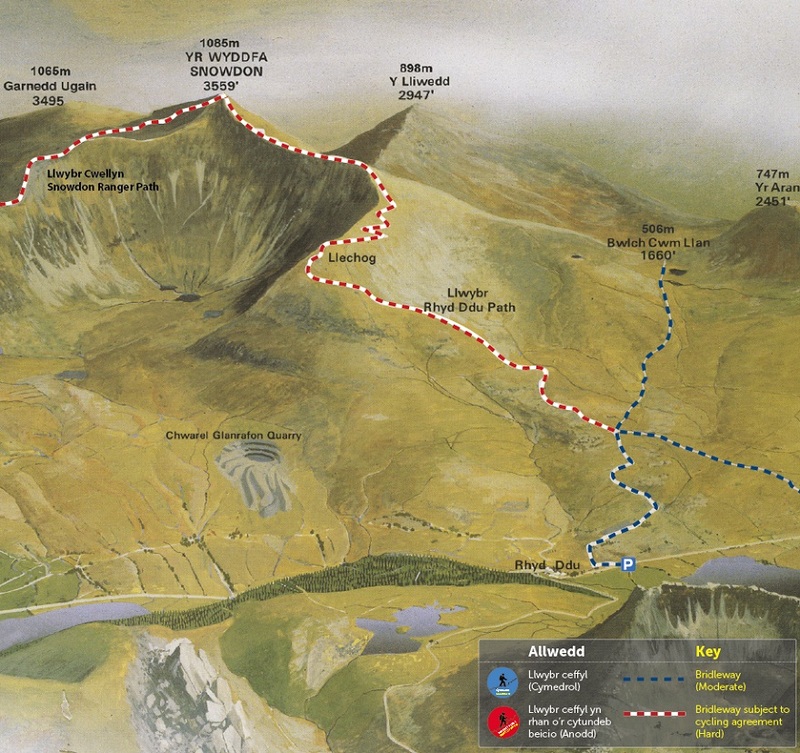 Llanberis Path is the easiest and longest of the six main paths to the summit of Snowdon. Originally, tourists were carried up this path on ponies and mules, and to this day it continues to be a pony path. Following the opening of the Llanberis pass in 1832, the Miners Path was built to carry copper from the Britannia Copper Works near Llyn Glaslyn to Pen y Pass, where it was then transported to Caernarfon. The mining came to an end in 1916, remains from the work can still be seen on the path to this day. Parking: Pay & Display car park at Pen-y-Pass. If the car park is full, you can park in Nant Peris (SH 607582 / LL55 4UF) and catch the Sherpa bus back up to Pen y Pass. There is some uncertainty about the origin of the word Pyg. It is believed that the path was named after Pen y Gwryd Hostel by climbers who stayed there. Another possible origin is that the path was named after Bwlch y Moch (the pass of pigs) since the path crosses it, as it is sometimes spelled as Pig in English. Or it could have been named Pyg due to the fact that this was a path used to carry pyg (black tar) from the Britannia Copper Works in Cwm Glaslyn. The guessing continues! This path was named after Sir Edward Watkin, Liberal Member of Parliament and a railway entrepreneur. Watkin had a summer house by the start of the path and he was responsible for creating the path from South Snowdon Slate Quarry to Snowdon’s summit. Officially opened in 1892 by William Gladstone, the Prime Minister, on a boulder by the path which has been named after William Gladstone he addressed a crowd of over 2,000 people. This path used to be known as the Beddgelert Path since it was from this village that walkers started their journey to the summit. The path begins near the ‘Snowdon Ranger’ youth hostel, near Llyn Cwellyn. John Morton the self proclaimed 'Snowdon Ranger' used the path to guide Victorian tourists to the summit. He also opened a tavern where the youth hostel site stands today, and called it the ‘Snowdon Ranger Inn’. Planning your transport and parking should form an essential part of your plan for climbing Snowdon. With over ½ a million visitors every year visiting the mountain, car parks can often be full in the warmer months by 7am! If you can we suggest coming during the week rather than on a weekend, and avoiding school holidays. Late September and early October can be a great time to visit. Details can be found in our paths guide below on the best parking and transport options for each path. If you plan on walking up the Pyg or Miners track we highly recommend using the Sherpa bus. You can view and download the Snowdon Sherpa Timetable from the Gwynedd Council website. The cost of a single fare on the Snowdon Sherpa Bus Service is £2 for adults, £1 for children and over 60s can go free. A £5 day ticket is also available, enabling you to hop on and off the Sherpa as you wish throughout the day. The service operates frequently at the most popular times, with regular services at other times. If you're looking for guides to help you on the mountains and give you a memorable experience then please visit our activity page. There's plenty to choose from including Anelu Aim Higher, RAW Adventures, Gradient Adventure and Bach Ventures. Interest in and the variety of charitable, recreational and organised challenge event activities has grown in recent years and there are a great number of organisations and charities making full use of the great outdoors in Snowdonia – particularly on Snowdon itself. For further information and guidance visit the Snowdonia National Park website. 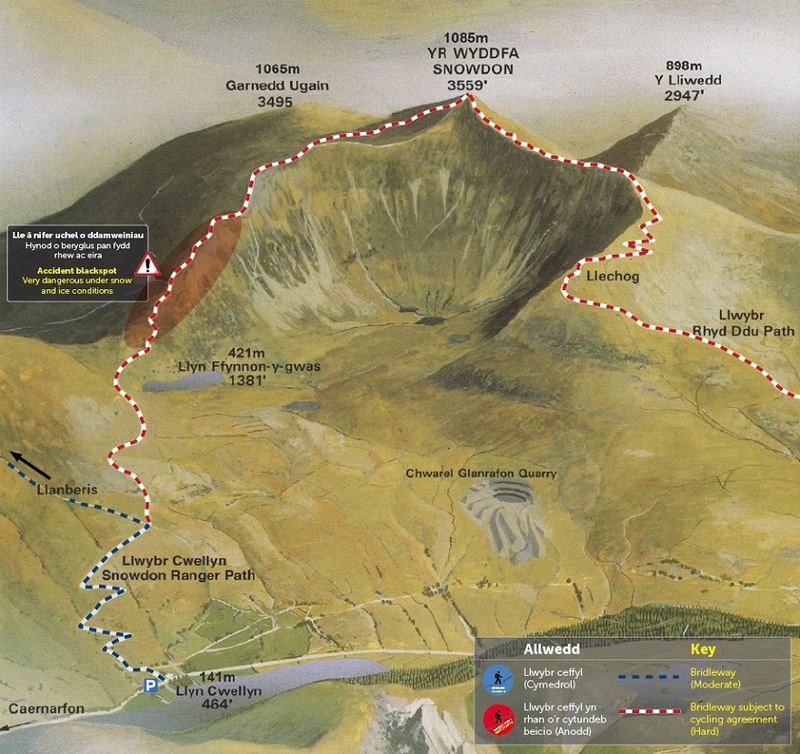 Here are some interesting secrets about Snowdon. In 1639 came the first recorded ascent of Snowdon, by Thomas Johnson. Morris Williams, a miner, was the first to sell refreshments at the summit in 1838. Edmund Hillary trained on Snowdon before conquering Mount Everest. You can find a rare flower on Snowdon, The Snowdon Lily. The lily can only be found in a handful of location across the world. Snowdon is said to be the tomb of the giant Rhitta Gawr. Rhitta wore a cloak made of men’s beard and was killed by the legend King Arthur.